Don't wait, Order now! Be the highlight of the party in your Orange Tuxedo by Bright Colored Tuxedos! 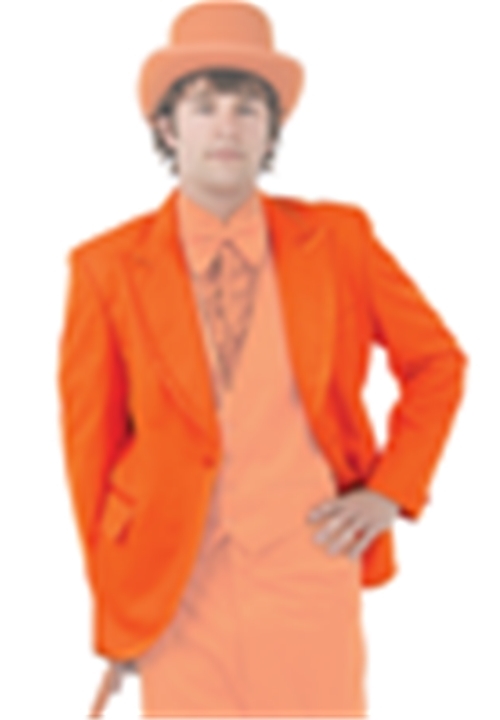 This Orange 1 button peak tuxedo coat is NOT just a costume, but an exact replica of the tuxedo featured in the classic motion picture "Dumb and Dumber." This Orange Tuxedo Coat features a self peak lapel with satin edge, a self top collar, a one button single-breasted front, self flap pockets, center vents, and is, of course, fashioned from Bright Orange Polyester. To complete the effect, have a friend order the matching Light Blue Tuxedo and you'll make a splash at any party dressed like everyone's favorite Harry and Lloyd! SORRY HATS, SHOES AND CANES ARE NO LONGER AVAILABLE.